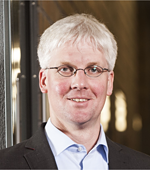 Christian Koos is a member of the board of directors at the Institute of Microstructure Technology (IMT) and the executive director of the Institute of Photonics and Quantum Electronics (IPQ). His research focusses on integrated photonics and the associated applications in high-speed optical communications, biophotonics, sensing, and metrology. Christian Koos received the PhD (Dr.-Ing.) degree in Electrical Engineering from the University of Karlsruhe in 2007. From 2008 to 2010, he was affiliated with the Corporate Research and Technology department of Carl Zeiss AG, where he led the technology forecast in area of nanotechnology. Christian Koos is the coordinator of the Helmholtz International Research School of Teratronics (HIRST), which offers an interdisciplinary training programme for PhD researchers that links the traditional disciplines of physics, electrical engineering, computer science, and nanotechnology. Christian Koos has authored and co-authored more than 280 papers in journals and archival conference proceedings and filed more than 25 patent applications. In 2012, he was awarded the Alfried-Krupp Prize for Young University Teachers, and in 2014, he received the Research Award of the State of Baden-Wuerttemberg. Christian Koos is founder of a start-up company.